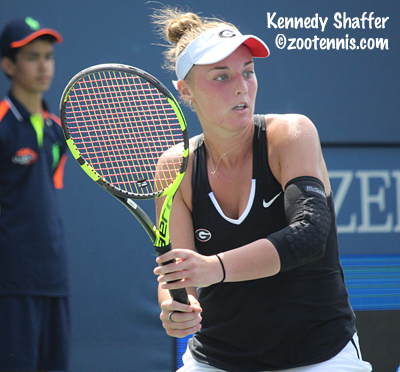 I spoke with all eight of the participants in the women's draw at the USTA's American Collegiate Invitational during the second week of the US Open to get their thoughts on the event, playing in New York, their schedules and their plans for the future. I will have a similar update from the men later this week, along with a recap of the tournament for the Tennis Recruiting Network. On her summer: It's was a good summer, played a lot of tennis, a lot of tournaments, got my ranking up there a little bit, so I was happy with the summer. On possibly turning pro after freshman year: I'm signed up for classes, taking it year by year and see how it goes. If I'm going to leave, I'm going to leave with confidence, knowing that I'm playing my best tennis and I've succeeded, or done everything I wanted to do in college. The competition is so tough in the pros and you don't see as many younger kids being top 100 anymore. On her major: I'm undecided. I'm probably going to go into sports industry, because I love sports and it's a little bit easier. On Ohio State's team: I think we're definitely a contender for a national championship this year. Last year was a bunch of firsts for our team, we were No. 1 for a week at some point. Two, three years ago we were unranked so to go to No. 1 was a really big achievement. Our team's working to get back to the NCAAs and do better than we did last year. 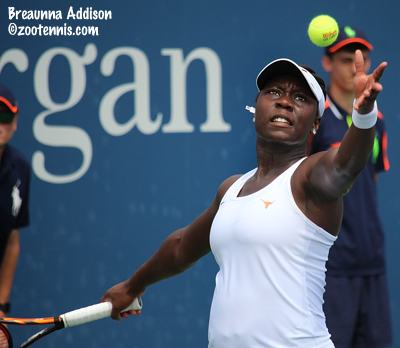 On her fall schedule: Right now I'm scheduled to play All-American and if I make to National Indoors, I'll play that one. I'm going to try to play some pro tournaments, see how that goes. I want to keep my pro ranking (currently 365) up. On her last season of college tennis: In some ways it feels like I've been there 20 years and in other ways I feel like I've been there for five minutes. But it's truly been the best three years of my life and I'm so excited for one more year. I did almost everything I could do last year individually, so this year, I'm looking to do everything team-wise that we can possibly do. I think we have a great team and I'm so excited for the future of the program, not just this year but going forward. On her major: I'm an economics major. I'm super nerdy, fun fact of the day. I'm better in the classroom than I am on the court. On playing pro tennis next year: That is the goal. I'm applying for quite a few grad school scholarships, but you can postpone those for five to seven years. So I'm going to play as long as I want to, as long as I feel I'm making adequate improvements on the court. I'm most excited for the doubles aspect of things. I think a lot of people throw doubles to the side sometimes, I think unfairly. I'm a big doubles player and I like the doubles game a lot. Hopefully I can play on these courts in the doubles game for sure. And hopefully in singles as well, but I'm looking to do whatever I can to be out here for as long as I can. On her fall schedule: I'm actually doing online classes this fall. I'm playing Stillwater, Florence and Macon (USTA Pro Circuit events), and I'm planning on doing All-Americans, Malibu and Indoors. I was out most of the summer with injuries, so I'm happy to get back in the swing of things. 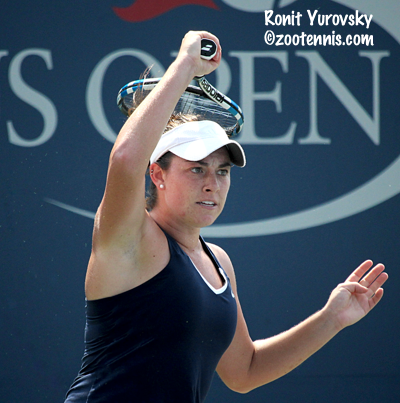 On her abbreviated preparation for the American Collegiate Invitational: I haven't played a singles match since July. I had a procedure done on my back and then working with Kourtney(Keegan) I was having a lot of pain and I figured I may as well do it now and get it over with, get ready to play doubles with Kort. On playing in the US Open women's doubles main draw: I've played singles a couple of times; I haven't played in the main, but I've played in qualies. To be in the main draw was a really cool experience. It was fun, we had a great time. We played Asia(Muhammad) and Taylor(Townsend), who got to the quarterfinals. We had some chances, a couple of games went to deuce, but here you play ad, and we're sort of used to playing no-ad now. We had a really good crowd, which we were surprised, because it rained half the day. 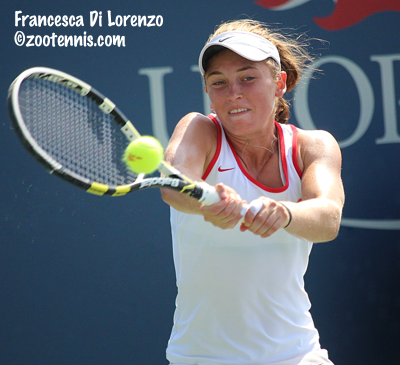 On her fall schedule: I'm going to try to play a couple of pro tournaments and then do All-Americans and Indoors. On her major: I was doing telecom, but I switched to criminal justice, because telecom got too hands on, more cameras, interviewing, you have to be in class. With as much tennis as I wanted to play, I needed to switch. After I'm done playing, whenever that will be, go to law school and do sports law. I think this is a great opportunity for kids like me who have never played here before. You get to experience what it's like, and I'll tell you what, if you're not used to it, it will destroy you. I've never played a junior slam, never played higher than a $25K before. This is a big, big difference. It's really great of the USTA to be helping people like me and others, who don't get to play these. I feel I've really taken a step up in a lot of things. This wasn't one of those days when you can say, wow, I'm seeing my progress show through, but it's a new stage, new pressures, new expectations and that's tough to manage. But right now, I feel I'm starting to make a lot of good developments in my game, so if I can keep going down the right path, keep working hard, [I'll] get things to come. On teammate Ellen Perez playing in the US Open women's singles draw: It's great. Any time you see a Georgia Bulldog, we're a family, and I was cheering from afar and I know the team was doing the same. We streamed Ellen's match, everyone was on live scoring. It was awesome to have her here and a good opportunity. On her fall schedule: I made main of All-Americans, so for once, I don't have to go through pre-qualifying. We have a couple of $10Ks on our schedule, I know there's the Florence $25K up there. I didn't make the Malibu, but hopefully back here for indoors. On playing in her hometown: I had a lot of friends and family come out, and I'm really appreciative of that. And playing in such an incredible place, no matter how you do, I'm going to use that experience in the future to my advantage. On her major: I got my degree in media studies. I had to do one summer session, so I finished in July officially. On her plans for playing after college: I'm going to play some pro tennis. I had a good $25K in Landisville (Pa., where she reached the final), so I'm definitely going to use that tournament to my advantage, keep it rolling hopefully in Atlanta($50K) next week. I got a wild card, but I'm just five out of the main draw, and it's a good thing to know that your ranking can get you that close, because I've never really had that because of college tennis. 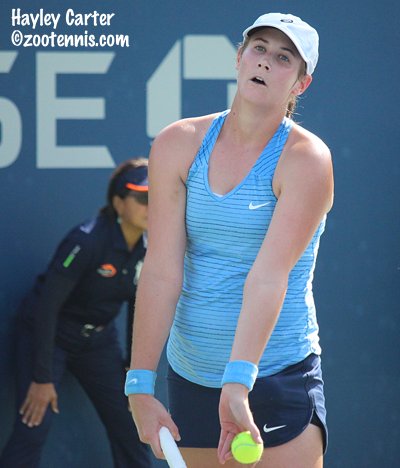 On her fall schedule: I'm just taking it one tournament at a time, seeing what I can get into at this point. I graduate in the fall and I'll be a coach for the University of Texas tennis team, so I'm really excited about that. I'll continue to train, and hopefully get a few (pro) tournaments in. I haven't really decided what's the next step, but I'm looking forward to graduating soon. My degree will be in sports management. On her summer activities and her injuries: This summer I actually took an internship and a few classes, so I didn't have a lot of time to dedicate to training. I think a lot of my injuries were caused by lack of being on the court and preparing. But I've had an elbow injury before and that's what I was experiencing today, and I think a pinched nerve in my ribs. But no excuses (Collins) played well. On playing on the USTA BJKNTC courts: This is amazing. I never played the junior slam here, so it's my first time here, as a player, so I'm really excited and blessed to have this experience. The atmosphere was like no other; this was the best experience I've had as a tennis player. On her mindset coming into the competition: I had a pretty good summer, made the semis at Winnipeg ($25K) and made the semis (at $10K in Austin) after that. So I had a little bit of confidence coming in here for sure; I felt pretty good with my game. I'd been here a week training so I felt pretty good, and I knew when I stepped on the court I was capable of winning. On her first exposure to the US Open: It's been really exciting to play this college event, because I never played the junior slams. This is my first time actually playing on these courts. It's been exciting playing here and I'm just enjoying it. This opportunity and experience has been amazing. Hopefully I'll be back next year, and the year after that. On completing her degree at Michigan: I graduated this May, with a degree in sports management. On her fall schedule: Right after this, it's just tournament after tournament. On finishing her degree: I took six credits in the summer, because I didn't want to do 15 and 15 each semester. I did a summer session, which was pretty intense; I went to school every day for seven hours. So I'm really happy to be done and have my degree. And it's a good thing to fall back on too. On the USTA's third annual ACI: It's really cool that they're putting on this tournament for college players. 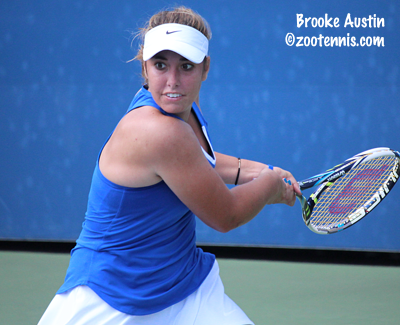 It really showcases the best players in the country and does a lot for college tennis. So I'm really appreciative of everything the US Open is doing in allowing us to play here. On having Nick Bollettieri as a personal coach: He's been working with me since I was in high school and he's still getting up in the mornings with me at 6 a.m., so we see a lot of each other in the morning, probably more than he would like, because I'm a grumpy person. He was here with me at the Open and he really wanted to see my last college matches. It’s great to see him in your corner, still kicking it, and IMG is a great place to train. All through high school I was there and then at winter break I'd go back, any weekend I had off from school I'd go train at IMG. On no-ad format in college: Tennis has traditionally been played with ads, so the fact that they're changing the scoring format, I don't understand the thought process behind it. I think it's time, but are we really get that match TV time for college tennis? That was one of the reasons they said we were going to do no-ad scoring, but we're not getting a lot of college tennis time on ESPN. We do get a little bit, and that's great, but I do think it's kind of sad that they're changing the game. I think the ads are a really important part. I don't know if Roger Federer would have won as many grand slams if he would have been playing no-ad.... But I won NCAAs one year playing ads and NCAAs one year not playing ads. So I don't know. I think I was the better player at NCAAs, I'd like to think that, but I'm still kind of confused on the whole rationale. On the benefits of college tennis: I think like a lot of people, I had a lot of growing up to do. I was very immature, and I think college was great for me, because it taught me to grow up and be more independent. I was really far away from my family when I went to Virginia and I didn't get to see them often, and that was really hard for me. But also with the challenges I faced academically, going to such a prestigious university, it really teaches you how to balance your time, and so many different aspects of life. I've taken so many classes that I'll remember forever and use them in my everyday life, but there's also experiences outside of the classroom that teach you a lot about life. I'm happy I went to college and I think everybody should go at some point in their life. I was able to watch several days of this event while at the Open and enjoyed it. I wwathced the men the most. After watching the pros play, it is clear that all of these college players have along way to go, although the potential is there. As to the 'no ad' scoring issue, I wish they would change the scoring format to what I call one ad scoring, which means that the deciding point is played on the 2nd deuce. Surely they must have statistics on this, but I think that only about 5% or less of games go to two deuces, so it would retain more of the traditional scoring, but still avoid those 4+ hour matches that often have plagued the NCAA tournament. I was hopeful that the change to 'no ad' would bring more TV to college tennis, but it did not happen last year. Something called Flo tennis is going to be available for a modest fee this year in conjunction with a deal with ITA, so maybe that will help. It is a streaming approach, but it is at least something. There is no way that 5% of deuce games only go one deuce (simple probability has add out player with 50% chance to get back to duece, advantage to the server of course, and higher percentage if he first serve goes in). I think no ad scoring is as big a deal as most do, but it is a great point that very little college tennis is on tv, and one of the reasons was for tv. You don't even see college tennis on tennis channel or Pac 12 network. The idea of making college tennis matches shorter is a good idea, but they accomplished that by shortening doubles. I said 5 percent or less go to two deuces.